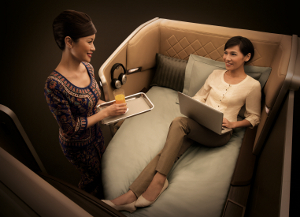 With five-star Skytrax ratings for its first and business class cabins, and a healthy four stars for economy, Singapore Airlines (SIA) has set a high benchmark for quality. However, despite such popularity, the airline is not about to relax, as rivals such as Thai, Cathay and Malaysia have since revealed spectacular new products. Hence SIA has launched a new generation of cabins, with the aim of setting a new benchmark in luxury. Nearly US$150m (€114m) and two years of development work have been invested in introducing the new products on an initial eight B777-300ERs entering the fleet, with further investment on the horizon as the cabins are introduced on the forthcoming A350 fleet. As SIA’s executive vice president, commercial, Mak Swee Wah, said at the unveiling, “The significant investment in our next generation of cabin products reaffirms our commitment to product innovation and leadership, and demonstrates our confidence in the future of premium full-service air travel. At first glance, the eight-seat first class cabin looks familiar. The palette and materials have all been updated, although in a subtle way in order to aid consistency and ease any future retrofit work on the rest of the fleet. But when you consider that SIA brought in a new design partner – BMW Group DesignworksUSA – for this cabin, you know there will be real depth to the project. BMW is not new to the aircraft industry, having carried out design work with aircraft manufacturers, and worked on bizjet interiors in the past. However, this project is significant for BMW as, while it has created some concept designs for airlines, this is its first airline project to have taken to the skies. The seat itself is all new, created with Jamco, although it features many familiar features that SIA felt worked really well on other aircraft, such as the 82in fold-down bed and extra-wide 35in seat. 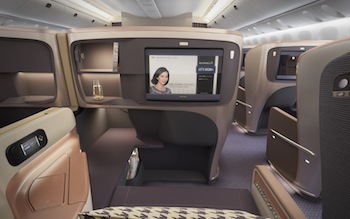 Triple-seven flyers don’t get the full suite experience of the A380, instead enjoying a more open experience that the partners feel offers more exposure to SIA’s strongest product of all: the service. Thus, while the cabin as a whole has a lounge feel, the seats were designed to have a definite exterior and interior, so once inside the cool grey shell, its contoured side panels highlighted by underlighting on the exterior metal rubstrips, you feel like it is your own space, a feeling accentuated by the warm beige and brown palette within, the carpet that contrasts with the aisle carpet, and the ambient lighting within. The vibrant colours are provided by the crew uniforms, shown to their best against the neutral palette. “Overall the seat is acting as a background for the more experiential setting,” says Aspegren. That renowned service also means that the seat doesn’t need to have a lot of functions, the focus instead being on offering the highest quality. This is achieved through smooth actuation, attention to materials for a quality tactile feel, and attention to detail such as the leather-lined stowage compartments with nicely damped lids. A stylish new passenger control unit next to the armrest makes actions such as adjusting the lighting, moving the seat, calling crew or turning off the IFE simpler – and also means that crew can switch off the IFE for passengers without disturbing their slumber. Of course comfort is critical to luxury, so a lot of development work went into selecting the right foam for optimal support. The full-grain leather seat covers could have been simply glued to the foam, but this wasn’t considered to be a quality approach. Thus the materials were stitched together, in a diamond pattern that not only oozes luxury in a style reminiscent of a Bentley, but also adds support and is less prone to large scratches. The quilted leather even extends to the footrest, and when the seatback is folded down to create the bed, a quilted headboard is revealed. An additional mattress is laid down by crew when making the bed, for a restful night’s sleep. To optimise the feeling of quality, the shiny parts aren’t lookalikes, they are real metal, including brushed aluminium and bronze finishes on some parts, and those leather-lined stowage compartments, which feel great and help protect valuables. This attention to detail is a key part of how BMW DesignworksUSA works, according to Aspegren: “We work with a first, second and third read. So you look at the object from a distance on the first read and ask if it looks pleasing and communicates the brand. Then, on the second read, you might notice that the panels have nice sculptings and you can see that it is an exclusive product. Then on the third read, when you’re actually touching it, you get that tactility and feel there’s a certain level of quality – for example through a tactile embossed leather. 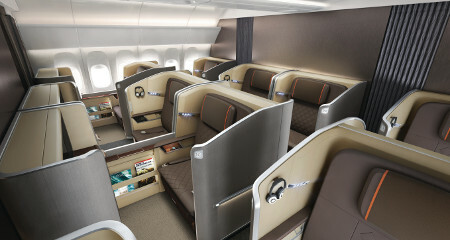 Following the success of the previous business class, SIA once again turned to JPA Design to create the new generation. The basic cabin layout is the only element that is carried over, retained because the configuration is very space efficient, allowing 42 28in-wide seats to be fitted, all with direct aisle access. When the seat is converted to a fully lie-flat bed, the sleeping platform is angled in a tessellated inverse herringbone configuration. 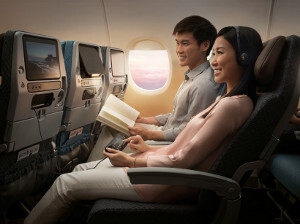 “All options were considered over the course of an in-depth study that JPA carried out with Singapore Airlines, but it was felt that the current layout optimised space for both the airline and its customers, who enjoy a spacious personal environment and a high degree of privacy,” explains James Park, managing director of JPA Design. Extensive work on this all-new seat – again a bespoke Jamco model – has created an extra 2in of bed length, taking it to 78in, with a better shape for sleeping. The flip-over bed design has been retained as SIA feels it offers a chance to enjoy the crew experience, as well as greater comfort. All this, plus significantly increased stowage capacity, has been achieved within the same footprint as the previous generation seat while retaining the 28in seat width, which the airline promotes as the widest business offer in the sky. The seat has two different recline positions, aided by an increase in recline angle from 128° to 132°: Lazy-Z, where the passenger enjoys a cradled position with their weight and pressure centred and balanced; and Sundeck, where the customer’s legs can be placed up onto the ottoman, and the seat base and leg rest move to form a large, comfortable surface to relax upon. The palette in business is a little more playful than in first, with JPA developing an expressive colour and trim palette, which offers continued elements of discovery. The combination of alternating shell colours in silver and champagne, complemented by a distinctive copper trim, helps elevate and enhance the feeling of space within the cabin as a whole. The inner seat colours also alternate, with taupe leather to complement the silver shells, while aubergine sets off the champagne shells. The sensory experience is enhanced by the bespoke woven textiles around the seat, while a nice touch is a continuation of the diamond-patterned leather, only now in an oversized pattern. Further consistency was achieved with nice touches such as the symbols and fonts on the controls being the same throughout the aircraft. This creates “personality and a play on scale: a modern theme of classic luxury design which will meet the expectations of business travellers for years to come. It has been an extremely satisfying and enjoyable project to work on”, says Park. Economy class has also received attention, building on its four-star Skytrax rating for seat comfort, again enhanced by that five-star service. This cabin was designed in-house by SIA, with an inch more legroom added, and comfort further enhanced by new backrest seat cushions with side bolsters for better back support, and a sculpted headrest cushion, which supports an increased range of height adjustments for better neck support. A nice touch is an echo of the diamond pattern in the seatcovers, again oversized so it resembles a check. Could it be enough to take all three cabins to five stars? 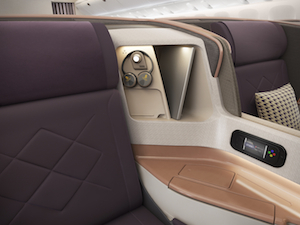 The latest SIA B777-300ERs also feature a new generation of the airline’s KrisWorld IFE system, based on the latest Panasonic Avionics eX3 hardware platform. This is the first introduction of the system and forms part of a US$400m (€303m) deal signed in 2012 that will see SIA fit eX3 on its newest B777-300ERs, as well as its forthcoming A350s, with potential retrofits to come across the rest of the fleet. The new KrisWorld features larger LCD screens and video touchscreen handsets across all classes. LCD screens have grown from 23 to 24in in first class, 15.4 to 18in in business, and 10.6 to 11.1in in economy. 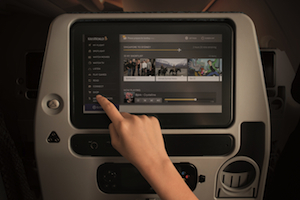 Economy passengers will also be able to browse through the more than 1,000 on-demand entertainment options by swiping or scrolling through the touchscreen monitor. SIA also worked with Massive Interactive to integrate the functionality of the video touchscreen handset into the core design of the KrisWorld user interface – for example, the handset can serve as a second screen, showing the moving map while a film is played on the main screen. The handset can also be used as a touchscreen trackpad to navigate KrisWorld. Further developments include ‘Quick Search’, where a flick of the handset pulls up a playlist of entertainment choices; the Notification Centre on the KrisWorld dashboard, which contains information relevant to the flight, reducing the number of onboard announcements; and greater personalisation, through content recommendations.